Leinster put their European disappointment behind them by beating Irish rivals Munster to move up to third place in the Pro12 table. Centre Garry Ringrose's superb break set up an early opening try for visiting skipper Isa Nacewa. Robin Copeland crashed over for Munster's reply just before half-time to leave them trailing 10-7. Jack McGrath scored under the posts to earn Leinster a 10-point lead and Zane Kirchner got a late interception try. 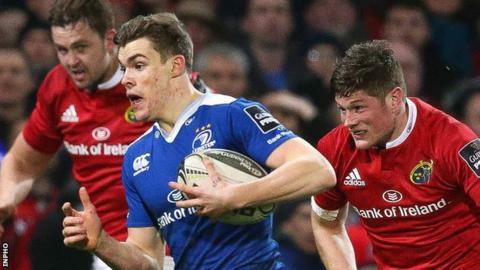 It meant a fifth straight defeat in all competitions for Munster. To make matters worse for Anthony Foley's charges, international winger Keith Earls was carried off wearing a neck brace late in the first half. Leinster stunned the hosts with an early try, as the fit-again Sean O'Brien sent Ringrose raiding down the right wing, the youngster leaving two forwards for dead before passing for Nacewa to finish by the posts. Ian Madigan converted and then landed a penalty following an advancing Leinster maul controlled by the impressive O'Brien. Munster got the boost they needed just before the interval when flanker Copeland scrambled over from a ruck just in front of the posts and Rory Scannell converted. Leinster were under pressure in the second half but emerged to score their second try as McGrath burrowed over from a close-in ruck. The icing on the cake came when Kirchner gobbled up a Francis Saili pass and sprinted clear from his 10-metre line. Leinster coach Leo Cullen: "I am not sure 24-7 reflected the game because we were hanging in there at times. "The guys showed great spirit and endeavour in defending. We stood up to it really well. "The lads were a bit light in confidence so it was nice to get this result." Munster: Conway, Earls, Saili, R. Scannell, Zebo, Bleyendaal, O'Leary, Cronin, Sherry, J. Ryan, Foley, D. Ryan, Copeland, O'Donoghue, Stander. Replacements: N. Scannell, Kilcoyne, Sagario, B. Holland, O'Donnell, Williams, Hurley, Gonzalez Amorosino. Leinster: Kirchner, McFadden, Ringrose, Fitzgerald, Nacewa, Madigan, Reddan, J. McGrath, Cronin, Furlong, Toner, Denton, D. Ryan, O'Brien, Heaslip. Replacements: Tracy, Healy, Moore, Molony, van der Flier, N. McCarthy, Marsh, D. Kearney.